Hey! 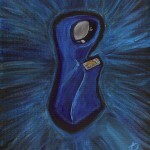 Want to obtain some of my artwork while supporting the radio show I work on and the station I'm part of? 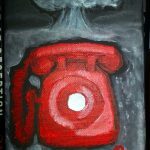 I've donated a limited quantity of my original paintings to WBAI Radio to use as thank-you gifts in our latest fundraiser! 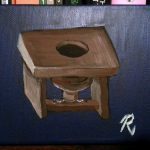 For less money than I'd normally charge for these sorts of paintings, you can help keep Off the Hook on the air and take some of my art home. 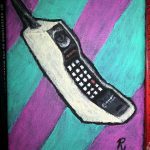 Click here for a look at some of the phone paintings, other art I've made for past WBAI fundraisers, and more of my work! Off the Hook is a weekly talk radio program by and about the hacker community, as well as related news and subjects of interest. It is broadcast Wednesday evenings at 8:00 PM Eastern US time, over the air at WBAI 99.5 FM throughout the New York metropolitan area as well as netcast and podcast worldwide. 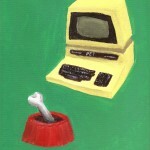 Off the Hook was started in 1988 by Emmanuel Goldstein, of 2600: The Hacker Quarterly. I discovered the show in the early 1990s, and remained a faithful listener ever since. Fast-forward through many years during which I met and worked with Emmanuel and company on various projects, and in 2008 I was invited to join the show as a regular panelist and contributor. My longtime screenname "Rob T Firefly" also serves as my air name. Here's a short video of us broadcasting out of our old Wall Street studio, taken by my friend Sidepocket while visiting the show with the Yes Men on October 14, 2009. Occasionally, when Emmanuel is out of town, I get the opportunity to sit in his place as live broadcast engineer during the show. Outside my normal duties on the air and behind the scenes, I've had the opportunity to contribute my services to our listener-supported station's fundraising efforts. Listeners who pledged their support to WBAI during certain fund drive episodes of our show have received original artwork or t-shirts of my own design as thank-you gifts. 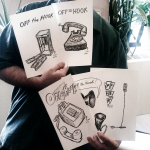 Drawing phones as a live on-air stunt on Off the Hook. 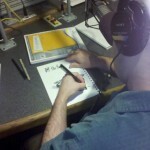 The completed drawings were given to WBAI supporters. 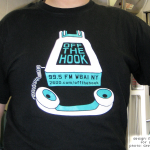 An official Off the Hook t-shirt. 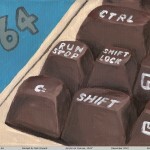 A selection of paintings produced for listeners; see the rest at my portfolio. For further information about Off the Hook, see the show's Wikipedia entry. The show is archived and podcast via its official site, which contains MP3s of every episode ever as well as instructions for listening live over the air and online. There is also a live player at WBAI's site. 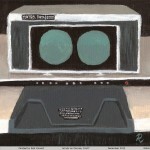 Trivia alert: here's a blog post I wrote about our opening theme song. Thoughts and opinions I express on this website are my own, and don't necessarily represent those of associates, colleagues, or anyone really.